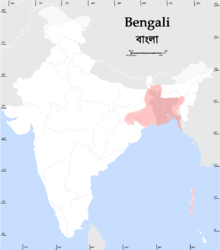 Bengali is the most eastern Indo-Aryan language from South Asia. It developed from a language called Pali. ↑ "Bangla Sign Language Dictionary". www.scribd.com. Retrieved 12 September 2018. ↑ Hammarström, Harald; Forkel, Robert; Haspelmath, Martin, eds. (2017). "Bengali". Glottolog 3.0. Jena, Germany: Max Planck Institute for the Science of Human History. ↑ "Statistical Summaries". Ethnologue. 2012. Retrieved 2012-05-23. ↑ "Statement by Hon'ble Foreign Minister on Second Bangladesh-India Track II dialogue at BRAC Centre on 07 August, 2005". Ministry of Foreign Affairs, Government of Bangladesh. Retrieved 2008-05-27.